Healthy family dinner recipes aren’t always designed for a busy life style. So we decided to take one of the most common, on-the-go dinner ideas and give it a healthy twist! Make fries by chopping up a potato and baking the slices in the oven until brown on both sides. Have the kids help you by dipping the fish into the breadcrumb mixture. Yummy! 1. Preheat oven to 450°F. Set a wire rack on a baking sheet; coat with cooking spray. 2. Place breadcrumbs, cereal flakes, lemon pepper, garlic powder, paprika and salt in a food processor or blender and process until finely ground. Transfer to a shallow dish. 3. Place flour in a second shallow dish and egg whites in a third shallow dish. Dip each strip of fish in the flour, dip it in the egg and then coat all sides with the breadcrumb mixture. Place on the prepared rack. 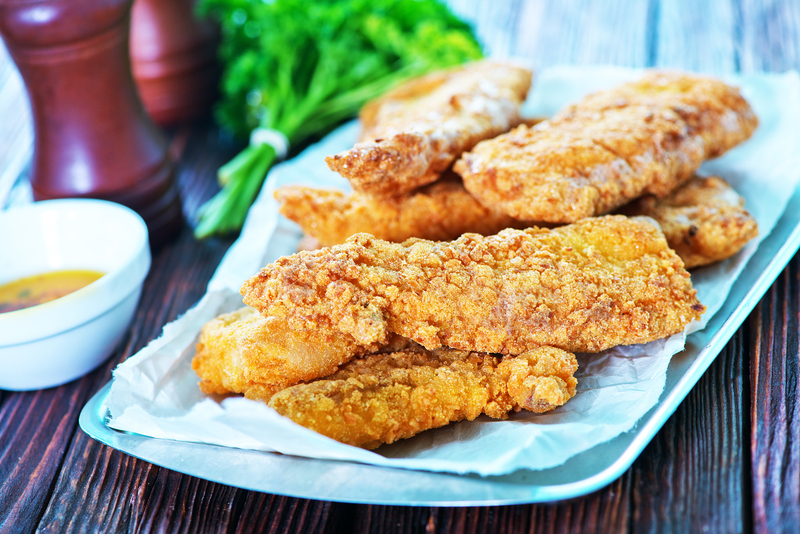 Coat both sides of the breaded fish with cooking spray. 4. Bake until the fish is cooked through and the breading is golden brown and crisp, about 10 minutes. In my book, The Step Up Diet, I provide a step-by-step plan to help families experience what it is like to eat the right way, the Step Up Diet teaches the body and the brain to recognize what types of food are healthy to eat, and to establish a healthy eating schedule. By focusing on one step—one segment of the day—at a time, the ultimate goal becomes less overwhelming and more manageable, helping us stay on target with our goals of eating healthier in 2015. Learn more about The Step Up Diet.